Any blindfold players here? Just wondering if blindfold chess is a skill that can be learned by amateurs like me or a natural skill by chess GM's, IM's, etc. Having always clear vision of the board. Properly move and capture pieces. Properly update the overall position on the board after the move is played. 1. Having always clear vision of the board. 1.1 If letter has odd parity and number does not, than it is a light square ( a2, c8, g6... Do you see the pattern now? ). 1.2 If letter and number both have odd parity, than it is a dark square ( a1, c3, g5... Do you see the pattern now? ). 2.1 If letter doesn't have odd parity and number does, than it is a light square ( b3, f5, h7... Do you see the pattern now? ). 2.2 If letter and number don't have odd parity, than it is a dark square ( c1, d4, h8... Do you see the pattern now? ). 2. Properly move and capture pieces. Here you have *starting square*->it is the square a piece stands on, and the *target square*, the one you wish to move your piece to. When moving/capturing you change the value of at least one coordinate, be that letter or a number. 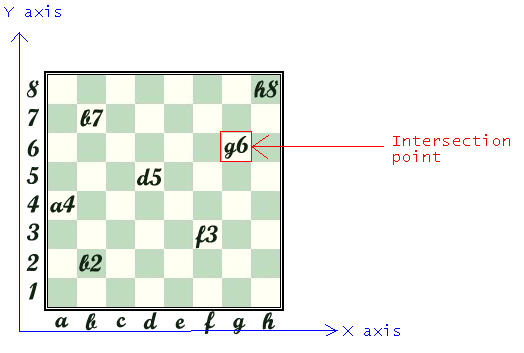 For example, when you move a rook from h1 to g1 notice that the letter coordinate got decremented by 1. The same goes for number coordinates, when moving a pawn from e2 to e3 notice how number coordinate incremented by 1. We shall adopt the format L[±/+/-]N[±/+/-]. L is the starting letter coordinate and N is the starting number coordinate. store simple adding/subtracting function describing how to calculate the valid coordinate for putting a piece, or be blank in which case the coordinate remains the same. This function uses symbols ±, +, - for calculation. The symbol / lists options ( you can always do only one mathematical calculation in the bracket. ) . For example, rook can move forward or backward so instead of writing L[+1]N or L[-1]L it will be shorter to write L[+1/-1]. Then you choose which function to perform, adding or subtracting. Furthermore, each option for L will have corresponding option for N, meaning that in this example L[-1/+1]N[-1/+1] you either do L[-1]N[-1] or L[+1][+1]. This will all be clearer in practical examples shown below. When moving a pawn, always increment by one the number coordinate. If testing for capture, replace the starting letter coordinate with its successor or predecessor, else do nothing. When you apply this for the diagram above, a pawn on f3 can move to f4 and capture on e4 or g4 and a pawn on b6 can move to b7 and capture on a7 or c7. L[ ±2 / ±1 ]N[ ±1 / ±2 ] for both capture and move. This means that we can move the knight on e[+2]4[+1] = g5, or e[+2]4[-1] = g3, or e[-2]4[+1] = c5 and finally e[-2]4[-1] = c3. This means that we can move the knight on e[ +1 ]4[ +2 ] = f6, or e[ +1 ]4[ -2 ] = f2, or e[ -1 ]4[ +2 ] = d6 and finally e[ -1 ]4[ -2 ] = d2. For the bishop is tough, but I was able to invent a solution that is simple and effective. Where ( x2 , y2 ) is the destination point, and ( x1 , y1 ) is the starting point. ( y2 - y1 ) / ( x2 - x1 ) can only be ±1, since we have a square, which gives us the y2 = y1 ±( x2 - x1 ) equation. Since we know both the starting square and target square all we have to do is check if the above equation is true and if is then bishop can move/capture on the target square! 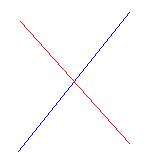 If your diagonal has direction like blue one in the picture above, you use + else you use - in the equation. In the diagram above bishop stands on e4 square. Let us use our equation to determine if it can move to c6 ( here we choose - since the direction of the diagonal is the same as the red one's in the mentioned diagram ): c = e - ( 6 - 4 ) = e - 2 = c which is correct result ( second letter before e is c ). Now let us test f6 ( here we choose + since the direction of the diagonal would be the same as the blue one's in the mentioned diagram ): f = e + ( 6 - 4 ) = e + 2 = g which is invalid and that is a correct result. Now let us test b1 ( here we choose + since the direction of the diagonal is the same as the blue one's in the mentioned diagram ): b = e + ( 1 - 4 ) = e - 3 = b which is valid and that is correct result. The target square must have equal letter or number coordinate, in order for a rook to go there. 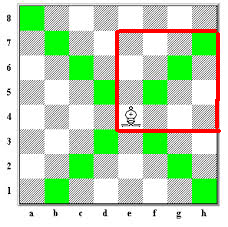 For example in the diagram above, rook is on e4 and he can move on any square that has at least one coordinate equal to his start coordinate. Therefore we can see that rook can stand on e8 because that square has the same letter as the starting square, or h4 since the number coordinates are the same. Either the target square has same letter or number, or must satisfy the equation I gave you for the bishop ( Target letter coordinate = Starting letter coordinate ± ( Target number coordinate - Starting number coordinate ) ). Target square number coordinate - starting square number coordinate must be 1 or -1. Target letter coordinate must be either successor or predecessor of the starting letter, or equal to it. e is the predecessor of f, which is good so far. 5(target number coordinate) - 3(starting number coordinate) = 2, thus this square is invalid. f is equal to f, so far so good. 2 - 3 = -1, which is valid result, so yes, king can move there. 3. Properly update the overall position on the board after the move is played. This is the place where your memory and physical fitness come into play. It will be hard for you to memorize which pieces were exchanged and where each one stand. Especially when you need to calculate lines this can be a cause of many mistakes. I hope that this answer helps you, sorry for posting late, I have a lot of work to do. These tips are really just a basic math and you really should have no trouble using them successfully. Still if you need help leave a comment. Can memory (or other brain functions) be improved or is it a natural trait? The answer is yes to both. While it is true that one's memory can be improved, it is also commonly observed that some people are more "gifted" when it comes to memory (and other brain functions) than others. A decent level of chess playing strength (if you want to play decent chess i.e. or one could simply have a fantastic memory and make legal yet nonsensical moves). I never "practiced" blindfold chess to learn it. I simply observed that as soon as my chess level got to FIDE 2000 level (for example), I could easily replay moves in my head and think "blindly". I don't have a great memory. I suppose my memory is average or slightly above average, but chess has surely helped to improve it to some extent. The way I do it is by visualizing a 2D board in my head (like a computer screen). The board doesn't have to be crystal clear (it's often hazy), but as long as you can "see" the pieces in their places, it's fine. I suppose that a chess player's ability to visualize increases the more chess he/she plays. This is normal brain development. The more you exercise a muscle, the better it gets. So I would suggest you practice visualization to get better at it. The real point of blind chess is to play chess blindly and yet play it well. So playing strength is indispensable or else there is no point in playing blind chess. If you play blind chess badly, you only prove you have a good memory and visualization power and nothing more. So, as an amateur, I would say your top priority is to improve your playing strength. Work on that and your memory and visualization will automatically improve. I learned to play blindfolded chess by practicing it from 2001 to 2005. In my opinion, it is a skill that can be learned, practice will give results. What I do is to try to visualize the chess board and the pieces on the board at every moment of the game. I have to update it one or more times per second, since it keeps vanishing. It does require considerable effort and you get tired after a single game, even at relatively short time controls. It might be easier to start off by having an empty chess board in front of you, when training. When practicing, you can ask a friend to play with the board and you sitting with your back to the board, getting and sending your moves verbally. Close your eyes, if you find it helps. Perhaps there are more books / articles out there! It is obviously a learned skill. No-one pops into the world after gestating for 9 months able to play blindfold chess! Just as no-one arrives destined to be an International footballer, genius mathematician or Olympic athlete. The real question is, is it learned by specifically training to acquire the skills of blindfold chess, or does it develop in some other way? I am a reasonably strong chess player (and was stronger when I was much younger) but have always been well short of IM or GM strength. Yet I can play blindfold chess with ease. Unfortunately it is not especially strong blindfold chess! It lags about 100 rating points below my OTB rating. The main difference is that although I make fewer gross blunders when playing blindfold I do not find exceptionally strong moves or plans either. I have never studied specifically for it but I have been able to play blindfold since I passed about 1800 strength. At least that is when I first tried it, and succeeded. The first hint that I might be able to play blindfold was when I realised that I could follow chess books without a board and pieces. When I got stronger I found that I could play several blindfold games simultaneously, so in my case the ability developed as a side effect of learning to play chess with a board and pieces. I suspect the same is true of most players including all those FMs, IMs and GMs that are much stronger than me. Isn't this what you would expect? In learning to play chess well we become intimately familiar with the board, with the powers of the pieces, and with the patterns commonly made by tactical operations and by positional features. We also calculate future positions by imagining sequences of moves and the positions to which they lead. These are the basic skills of blindfold play, so it is not surprising that the skill can develop naturally alongside increasing chess strength. This is not to say that you cannot train specifically to play blindfold. I expect that you can. But I do not think that is how most chess players gained the skill. Blindfold chess is not such an exceptional and amazing mental feat as it is thought to be by people that don't play chess (and by some that do!). I do not know of any strong player that cannot play blindfold. I have challenged some strong players that have never tried to play blindfold to give it a try, and they have always managed it with some ease. What is strong? Well no-one I know that has achieved a rating of 2100 or more has failed this challenge, and many with lower ratings have managed it. I just want to share what I am doing now to improve my blindfold chess visualization skill. I downloaded a dozen of minigames of 10 to 15 moves in PGN format from chessgames.com , then I load it from my chess PGN application from my mobile phone. Then I read the PGN and play it on my mind without browsing it from my PGN reader. As I finished the game from my mind. I verify the position by playing the actual game from my PGN reader. I am using Chess PGN Master available from Iphone and Android. I feel happy every time I finished a game that matches exactly from the game I visualized. I think this stepping stone would put me someday from playing blindfold chess. the ability to play blindfold chess develops naturally as chess ability improves. By getting better at chess, one gets better at blindfold chess. If Marc Lang from germany could play 46 games blindfolded (at once) then there is a chance that you could play one. Blindfold Chess is an ability which can be learned with Practice . Though some People may learn it faster than others but with average Chess intelligence it can be achieved . As like Magnus Carlsen who can play blindfolded with 10 Opponents at a time is something God Gifted but with the Training the Average Player can achieve to play one person blindfolded at one time. Every Chess Player should try enhancing this Quality because it gradually helps in doing better Chess calculations & Visualizations in Games. I have a USCF of around 1500 and I can play blind, so if that's what you're looking for it shouldn't be overly difficult. I did have to push myself a little though. I want to try multiple boards, we'll see. I don't play blindfold but I've been told by people who do that if I want to start learning / training then the place to start is by mentally splitting the board into 4 quarters: a1-4xd1-4, e1-4xh1-4, a5-8xd5-8, e5-8xh5-8. Then picture the pieces in these 4 quarters independently of each other. So, hold in your mind a picture of the first quadrant. Then do the same for the second quadrant, etc. Finally bring the 4 quarters together in your mind. I play in chess tournaments in Philadelphia and in the U1500 section( i think) is a blind man. He has his own separate room to play in and there are special rules that apply to him. To record the moves he has an audio recording device. He also plays with 2 boards. The main board with the real pieces the opponent plays with and a special board with peg holes for the pieces. On the pieces of the special board are metal balls on the Black pieces so he can distinguish pieces. He is allowed to touch all the pieces on his board so he can visualize. His opponent has to help him and move his pieces on the main board but he is very independent non the less! In my mind that is the real blindfolded chess! This is not a technical answer. Playing blindfold can be practiced and you can gain proficiency upto a level. But beyond that level, as it is with normal chess, you need talent, pure talent. Exercises for blindfold chess playing. Not the answer you're looking for? Browse other questions tagged learning grandmaster blindfold-chess beginner talent or ask your own question. Books that help improve your chess without a chessboard? Is it beneficial to play blindfolded chess?